Mac OS with its enhanced features of applications are now being hacked off from its security circles, allowing the non-Apple PCs to run the Mac OS valuing cheaper than that of the original Apple PCs. With the tweaked version of the OS hackers enjoy the benefits of Mac while VMware also helps in supporting other PC hardwares too. Tweaked Mac OSX is now downloaded from the Bit torrent file distribution systems for PCs. Mac OSX is otherwise referred as (The hacked version) OSx86, MacIntels and also as MacTels as they run on Intel microprocessors instead of the Power PC processor which is used normally for Macs. 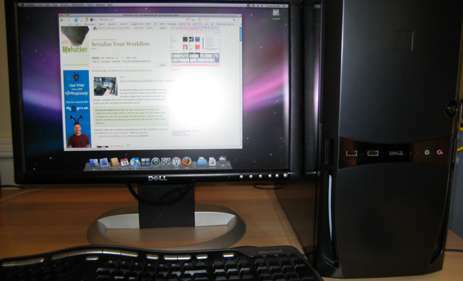 Mac hacking methods came into effect in the year of 2005 with a bang on hitting the Apple’s Mac OS into ordinary PCs. On evaluating the performance ratio it is observed that OSx86 runs faster on PCs when compared to the one running over Macs. It is still under cover that no one knows the reason behind this extraordinary performance of OSx86 that even exceeds the G4 and G5 in the processing speed. Some of the views from larger software companies include the statements that “Pentium is quicker in process, Intel chip architecture is well versed than Apple’s, the performance is raised as they completely run in the beta version of the system and so on”. But the true reason behind is under study. The only knowledge one must possess to install Mac OS in one’s system is how to hack into the hardware components as most of the emulators find it difficult to identify the hardware components. A hard drive partition and ISO image out of DVD disc are basic ones needed for installation. Some PC configuration does not support the working of installation of Mac OS as they are designed in specific. How to hack into a PC effectively? Hitting the security system to get access into the informations or raising the performance with the help of combined components of various Company products more in common to make the best out of the available in today’s world that makes the difference. Professionals go for the components that work best producing the extreme results for their PCs rather than going for single branded product. The chip that stops other PCs from running the OSx86 is the Trusted Platform Module that is TPM chip. At times hackers remove the complete component that is TPM kernel extension (Apple TPMACPI.kext) to keep off the security issues when making use of the OSx86 in other PCs. Some of the hacking methods include the disabling of the sensitive chip or the modules that act specific to the version of the PC or that acts as the secure processing component that keeps up the brand name of the application features of the new version of PCs. The author of this article has expertise over Computer Hacking techniques, online yahoo password hacking and security issues over networks. Feel free to contact on writing more about the hacking methods and tricks.